"In the light of the moon, near the sea, in the isolated places of the countryside, one sees, all things take on yellow shapes, indecisive and fantastic." - from Songs of Maldoror by Comte de Lautremont, translated by JL. Night has been a source of wonder and speculation to artists, a subject so vast that it begs to be pondered. Are we immersed in the universe through darkness or do we become deatched from it? Or both? Nocturnal journeys under the moon and beneath the stars can induce a sense of vertigo in this "kingdom of the indistinct." A visual vocabulary that draws on abstraction is certainly well-suited to this subject. Peter Doig painted The Milky Way when he was still a graduate student at the Chelsea School of Art. "At the time I rode my bike every day to Chelsea along the Embankment and was looking a lot at Whistler's quick washy paintings which often had a small figurative element. The stars themselves came from a star chart of one of my fellow students. They represented the Milky Way in November which is when I painted them in." 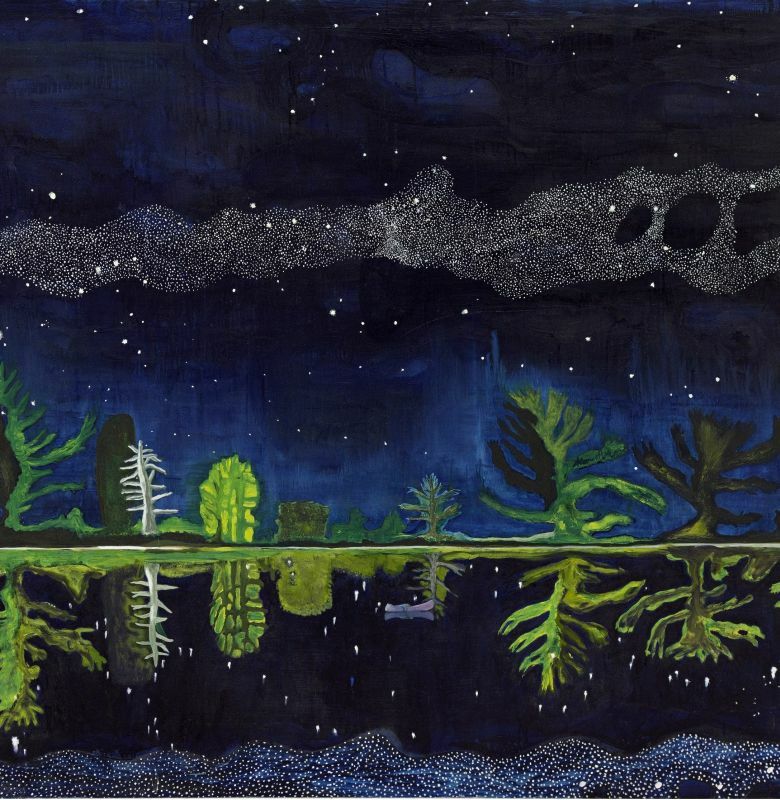 Doig's Milky Way is a masterpiece of indirection. The reflections in preternaturally still water show a world where earth has disappeared, become liquid. Trees and stars both clump and separate in their reflections. Doig shows us the vastness of the universe in that night sky by placing a young girl adrift in a canoe at the center of the image. Vincent Van Gogh wrote in 1888, "Often the night seems more richly colored than the day." Jan Sluijters, agreed with his Dutch compatriot on the evidence of Maanacht IV. It was at the turn of the century and more than a decade after Van Gogh's death that his work become known to a generation of younger artists who seized on night as a subject for their radical new style. On his way home from travels sponsored by his Prix de Rome, Sluijters passed through Paris in 1906 and took Fauvism home with him to Amsterdam. The red halo around the moon in Moonlight illuminates a landscape where everything solid appears to be red-hot. Oddly enough, I recently saw a photograph of a sunset landscape with water with these same colors. Who can say definitively that this vision is unrealistic? 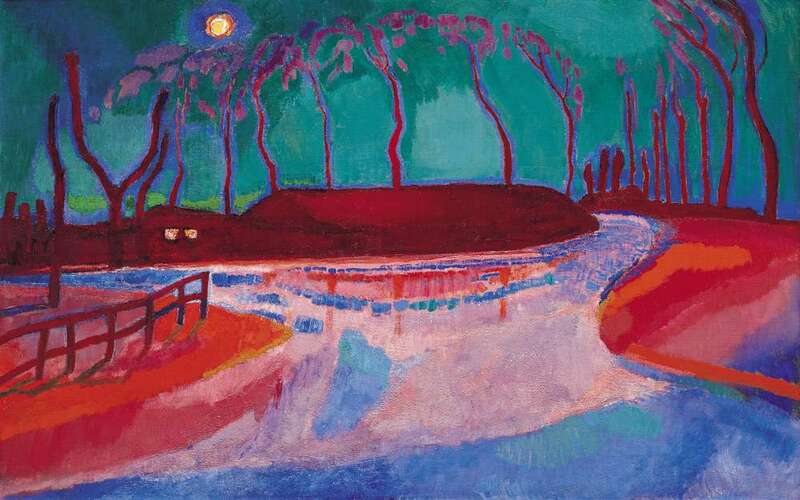 At the time he painted Moonlight in 1912, Sluijters was a prominent avant-garde painter who inspired Piet Mondrien whose fame would outpace his own. Henri Michaux wrote a poem to explain (!) or obfuscate The Prince of the Night. of the divided Kingdom, of the wooden hand. Petrified prince in the panther dress. Henri Michaux grew up in Brussels and, after moving to Paris in the 1920s he would denounce all things Belgian in his background. He became quite the explorer of unusual outposts, visiting Argentina and Uruguay, and even writing a book sort of about Ecuador (1929). His refusal of public appearances and interviews and even awards gave an impression of an artist fleeing his public. Disdaining to attach specific meanings to his works, Michaux did his best to repel the attempts of others to impose them. He made art in very controlled ways to reach an uncontrolled ends. 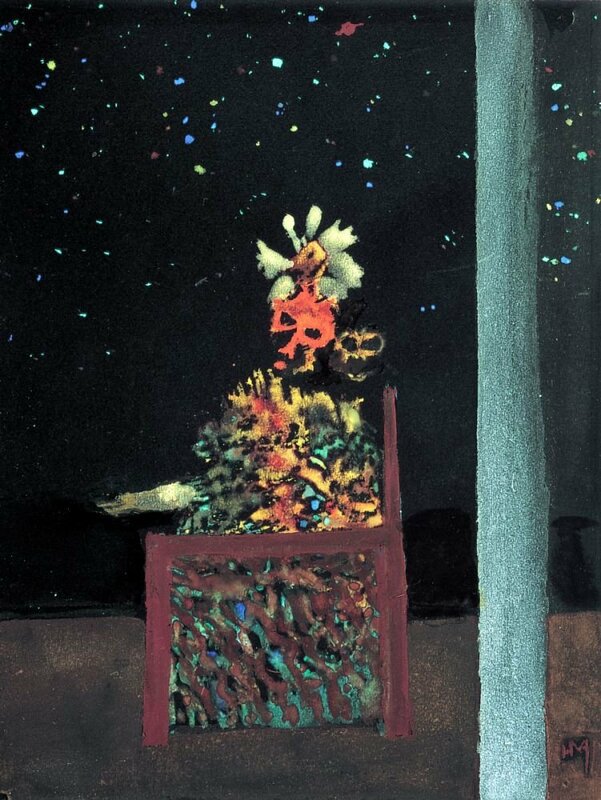 Ripples of orange, red, blue and even green flow across a black paper background in Le Prince de la Nuit. Using black as his background color rather than the customary white was another of Michaux's deliberately provocative but inscrutable choices. It is possible that the royal purple of the throne is its only decipherable element. So full of contradictions and prolific in both words and images, it comes a no surprise that the Michaux Archives in Paris are vast, they contain multitudes, as Walt Whitman might have said. Thanks to Tania for reminding me of nocturnal paintings by Leon Spilliaert and William Degouve de Nuncques, two Belgian artists. 1. Peter Doig (b. 1959) - The Milky Way, 1989, National Galleries of Scotland, Edinburgh. 2. Jan Sluijters (1881-1957) - Maanacht IV (Moonlight) 1912, Museum Voorlinden, Wassenaar, Netherlands. 3. Henri Michaux (1899-1984) - Le Prince de la nuit (Prince of the Night), 1937, Pompidou Center, Paros. Tania, yes. These two Belgian artists made beautiful night pictures. Vertigo-inducing, too, in Spilliaert's work. I should add links to them, thanks to you. O! I've just finished reading the book, "The End of Night," by Paul Bogard. This art would have fit right in. Rouchswalwe, thanks for the book recommendation.